The broken-hearted catch still haunts the voice, sweetly sad amongst the relentless rhythm of programmed drum beats and analog synths. With I Can't Keep All of Our Secrets, Rae Spoon's most electronic adventure to date, the former folk artist moves ever deeper into the world of electronica and dance beats. But one foot remains firmly planted in country heartbreak. This is no shiny happy dance album. On first listen, it's easy to gloss over the deeply personal lyrics in favour of the upbeat vibes and hypnotic danciness. That all changes when When I Said There Was an End to Love I Was Lying starts playing. In the first of the understated ballads on the album, the instrumentality is stripped back to allow Spoon's sweetly plaintive voice to take centre stage. The raw emotional power is enough to make you go back and really listen to the tracks that have gone before. Each subsequent listen reveals more depth. 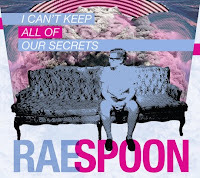 Rae Spoon has an achingly evocative voice that you don't normally hear in electronic music, and that in itself makes this album an anomaly. That this is a deep and intensely personal electronic album cements that anomaly. I Can't Keep All of Our Secrets, written in the aftermath of a friend's sudden death, follows the complex path that grief can take. In between the nostalgia and the pensive moments, nestled amongst the electronic beats, are inklings of hopeful connection, queer-positive openness, and gratitude. Recommended tracks: Crash Landing, When I Said There Was an End to Love I was Lying, Curses on Us. Definitely worth repeated listens. I would think Rae's voice a good mix with electronica. The title of the album is certainly evocative. It's an unusual mix, Vicomtesse, but it certainly works well. You have a more open ear than I do, I think.